Reactive Downhole Tools, supplier of lower completion systems to the global oil and gas industry, is celebrating the completion of six North Sea installations for multiple operators on both the UK and Norwegian continental shelves, worth in excess of GBP 500,000. One of the installations was manufactured to incredibly tight deadlines, and Reactive delivered its swellable packers 36 hours ahead of schedule. Due to the rig being shut down whilst waiting on equipment, the time saved added considerable value to the customer. The team also achieved an industry first as one of its swell packers was deployed in an exotic brine blend that would ordinarily rule out the use of swellable technology. Globally, the firm has also signed two new long-term agency agreements in Bahrain and Pakistan and invested an additional USD 250,000 (GBP 190,000) into its Houston facility. The investment has enhanced Reactive’s ability to manufacture more components in-house, allowing greater control of quality and delivery. “The fact that we have in-house manufacturing in both our Aberdeen and Houston facilities gives us the ability to quickly turnaround tailored and bespoke solutions for our customers. It’s this provision, as well as our continued focus on providing outstanding customer service, that really sets us apart from our competitors. Our success is testament to this and it’s why we continually invest in new equipment – including our recent purchase of a HAAS four-axis vertical mill and a fully automated pipe blasting system. The equipment is capable of handling both carbon and CRA pipe in full range three lengths,” adds Allen. 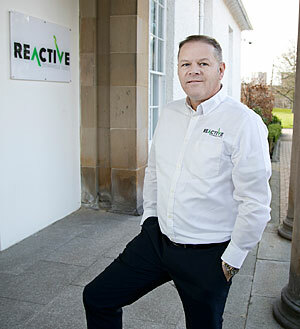 In 2017, Reactive appointed Derek Fullarton as regional business development manager for Europe, Russia and Africa, to establish and continue successful relationships with the firm’s international clients. Derek’s experience includes a combined 30 years with Weatherford and Halliburton UK. Within both firms he held managerial, engineering and leadership roles in intelligent and well completions.